Fr John Travers died peacefully on Monday, 2 October 2017, in the SMA House, Blackrock Road, Cork. Fr John was in his 92nd year. Ordained in 1956, Fr John was a missionary in Ibadan, Nigeria. He also served in Shrewsbury diocese, England and, for nineteen years, in the Archdiocese of Armagh. He retired to the African Missions, Dromantine, Newry in 1997. Due to failing health he transferred to the SMA House, Blackrock Road, Cork earlier this year. Fr Lee Cahill SMA celebrated a Thanksgiving Mass for the life of Fr Travers on Wednesday, 3 October, in Blackrock Road. The remains of Fr Travers were then taken to Dromantine for a Wake that evening which was well-attended by neighbours, local clergy and many parishioners from the five parishes of Armagh Archdiocese where he served. Many people shared stories of extraordinary acts of kindness which Fr Travers had done for them. It was heartening to hear such stories, some going back over 30 years when we are more likely to hear complaints about clergy than praise. 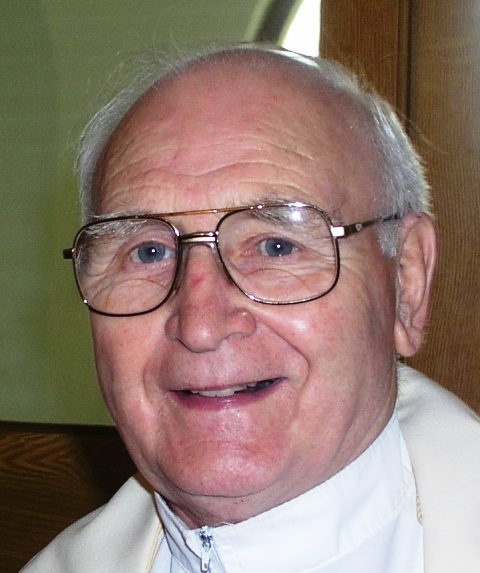 Fr John touched deeply the lives of many people. Sixty people attended a Mass in Dromantine on Thursday morning before Fr Travers was brought home to Cookstown for his Requiem Mass in the Holy Trinity Church. It was remarked before the Mass that when Fr John left Donamore parish to retire to Dromantine (1997) he was helped by two local men, Kieran Loughran and Micky Lagan. The Funeral Undertakers who brought Fr John back to Tyrone were the nieces of Kieran Loughran. No doubt Fr John would have smiled at this happy coincidence. H E Cardinal Seán Brady presided at the Mass which was celebrated by the SMA Provincial Leader, Fr Michael McCabe, assisted by 20 diocesan and SMA priests. Fr Laurence Boyle, Parish Priest, received the remains of Fr Travers and Fr Emlyn McGinn was MC. Fr John’s surviving sister, Mrs Betty Vickers, was accompanied by her children as well as nieces and nephews who had travelled over from England for the funeral. After the Mass, Fr John was laid to rest in St Lauren’s cemetery in the Travers / Patterson family grave. Fr McCabe delivered the following homily. “He will wipe every tear from their eyes; there will be no more death, no more mourning or sadness. The world of the past has gone”. “I consider that what we suffer in this life can never be compared to the glory, as yet unrevealed, which is waiting for us”. Yes, it is my Father’s will that whoever sees the Son and believes in him shall have eternal life and that I shall raise him up on the last day”. The God who created us in love is a God of promises, and his greatest promise, as expressed in the readings we have just heard, is to destroy the power of death, and raise us up on the last day to share in the glory of his Son’s Resurrection. Fr John’s entire life was shaped by his faith in this promise – a faith he shared with all those he served as a priest and missionary in Africa, England and Ireland. He has gone ahead of us to share in that fullness of life which awaits all of us at the end of our earthly pilgrimage. It is appropriate in this context to recall briefly some of the key moments of John’s life as priest and missionary. Born in Cookstown, Co Tyone, on 30 October 1925, John was the only son of a family of four of William Travers and Mary McEllhannon – one boy and 3 girls. He was the eldest member of the family. John was what we used to call “a late vocation.” He had qualified as a motor mechanic before deciding, at the age of 23, that he wanted to serve the Lord as a missionary priest. So, in 1948, he entered the minor Seminary of the SMA in Ireland at Sacred Heart College, Ballinafad, Co Mayo. Two years later, he joined the SMA Spiritual Year programme at Cloughballymore, Kilcolgan, Co Galway, where he also completed his study of Philosophy. From there, John moved on to the African Missions Major seminary in Dromantine, Newry, where he undertook his theological studies and further training for Priesthood. He, along with 12 other classmates, was ordained to the Priesthood by Bishop Eugene O’Doherty in the Cathedral of Saints Patrick and Colman on 13 June 1956. Two of his classmates are still living in our houses in Cork, Fr Richard Wall and Fr Michael Igoe. Following Ordination, Fr John was appointed to the then Prefecture of Ibadan, were he was to spend the next 16 years of his life – from 1956 to 1972 – working both in the fields of pastoral ministry and teaching. An eminently practical man, with a keen eye for beauty, and gifted with his hands, Fr John was very involved with the physical development of the Church in Ibadan. Eleta Church and Hospital and the churches in Mokola and Ikire were just some of the buildings he was involved in constructing. Countless schools were constructed under his direct supervision and many people, including his SMA confreres, benefited from his advice with their building projects. In 1971, while on vacation in Switzerland with some friends, John was involved in a serious car accident, when the driver of the car he was in suffered a massive heart attack and crashed into a stone wall. Of the four occupants of the car, John was the only survivor. Following a lengthy period of recuperation, Fr John embarked on further studies, taking up a one year course in student counselling at Keele University in Staffordshire, England. After completing this course, which he thoroughly enjoyed, John returned to pastoral ministry, serving in a number of parishes in Shrewsbury diocese from 1973 – ’78. 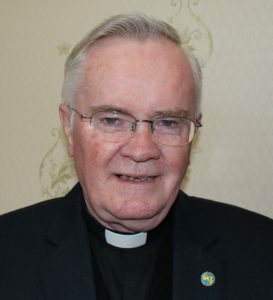 Following a request from Cardinal Tomas O Fiaich, and with the agreement of his Provincial Superior, Fr John agreed to accept the post of curate in Loughgall parish. Thus began 19 years in the service of the people in Armagh Archdiocese. He laboured in Loughgall, Aughnacloy, Beragh, Camlough and Donamore. John is remembered by the people of those parishes as a kind and devoted pastor, always prepared “to walk the extra mile” with them. Alongside his spiritual ministry, John’s expertise as a builder served him in good stead during these years. Among the many projects he was involved in was the renovation of the parish hall in Beragh. From 1997 until early this year, Fr John lived in the SMA House in Dromantine, most of the time in active retirement. Blessed with robust good health, he continued to help out with pastoral service in several neighbouring parishes in the diocese of Dromore and the Archdiocese of Armagh. 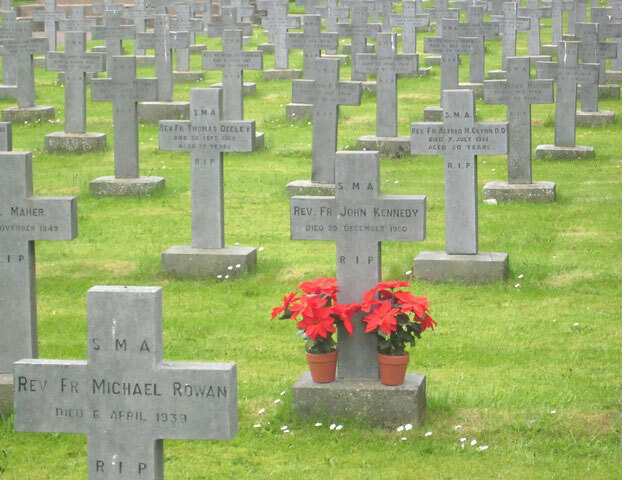 He also put his lively creative imagination and practical skills to good use, enhancing the wonderful grounds of the House with the beautiful outdoor Stations of the Cross – a gift from the Alexian Brothers in Warrenpoint, and one of the many attractive features of the Dromantine Retreat and Conference centre today. I have already made reference to John’s eye for beauty and skill with his hands. In Dromantine he had ample opportunity to put his mechanical and building skills to good use. Another not so common skill for which he was noted was the craft of wood turning, which requires a good eye and a steady hand as well as the knowledge acquired only through patient practice. Many examples of his craftsmanship can be found in Dromantine and in the houses of his many friends. I cannot end this homily without mentioning Fr John’s great love of nature. The created world around him was, for him, the sacrament of God’s presence. In whatever task he turned his skilful hands to, he sought to bring out and enhance the beauty and goodness of creation. Like the poet, Gerald Manly Hopkins, he saw the world around him “as charged with the grandeur of God.” St Paul, in the second reading chosen for today’s Mass, reminds us that “creation still retains the hope of being freed, like us, from its slavery to decadence, to enjoy the same freedom and glory as the children of God”. I like to think of John in particular as a privileged instrument of God in the ongoing liberation of creation, ‘groaning in one great act of giving birth’, until it shines forth with the glory intended for it by the creator.